Augsburg - Bavaria has always been regarded as a hotbed of German football, but one side from the southern Germany state would likely not be the first on everybody's lips. With TSV 1860 Munich and 1. FC Nürnberg among the first five winners of the Bundesliga, the league was already speaking with a Bavarian twang before FC Bayern München's emergence. Now, step forward FC Augsburg, a side emerging as a new force in the region, in the country, and perhaps next year, also on the continent. Theirs is something of an unlikely story. Located just a half-hour's drive from the state capital, never have they been so close to emulating their Munich neighbours' achievements as they are now. The potential was always there, boasting an average of over 22,000 fans taking in their matches in the lower tiers with a record of over 80,000 taking in a derby at 1860 in the 1973/74 season, when the club's hitherto most famous representative Helmut Haller chose to return to his hometown club following an 11-year stint in Italy. It was not until 2011 when Jos Luhukay finally guided the club into the top flight, a campaign which culminated in Augsburg surviving with a game to spare. The summer saw the club shake things up with Markus Weinzierl taking over from the departed Luhukay, hoping to help them avoid the drop in the dreaded and frequently deadly second season after promotion. With that year behind them though, Weinzierl has gone on to upset the odds, and the expectations, by guiding Augsburg to the brink of Europe. They head into Matchday 34 needing a positive result against Eintracht Frankfurt to stand a chance of ousting seventh-place 1. FSV Mainz 05, and entering the UEFA Europa League for the first time. 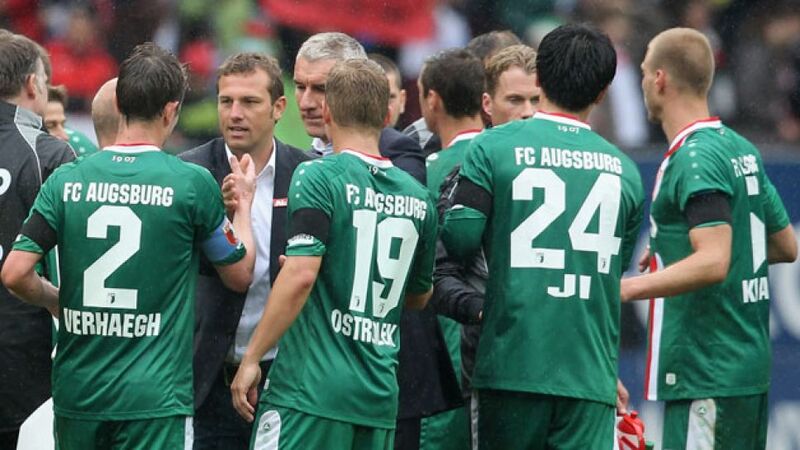 Two figures can be held ultimately responsible for this unlikely emergence which is putting Augsburg well and truly on the footballing map: Weinzierl and director of sport Stefan Reuter. "He's young and he's doing a fantastic job," said none other than FC Bayern coach Pep Guardiola of his colleague in the coaching fraternity. "For me, he's one of the best coaches in the Bundesliga. His team are aggressive, and they attack quickly." Weinzierl's calm, considered approach, and ability to turn a team of relatively unknown individuals into one highly competitive unit have earned him such prestigious acclaim. This season, the likes of , and have become household names while and have brought their experience to a side which seems to have struck the right blend on and off the field. Reuter takes as much credit for the formation of a side from a city which, until recently, was more famed for its puppets than its football. "Stefan Reuter is not only a proven expert in the field, but he also embodies the values of our FC Augsburg," said the club's president Walther Seinsch when he recently announced the extension of the former FIFA World Cup winner's contract until 2018. "With him, we want to establish FCA in the Bundesliga together successfully." Reuter said: "It's incredibly enjoyable working with this team, which is why I knew straightaway that I wanted to continue helping to form FCA as a stable Bundesliga side, step by step." Having broken points and win records, as well as beating Bayern this season, qualifying for Europe would place the cherry on top, and ensure Bavaria has one further club to be proud of.